Moving now from the Triassic to the Early Jurassic, we find that the dinosaurs have attained dominance, while most of the other Triassic types of animals have died out in two major Triassic extinctions - the mid-Carnian and the terminal Rhaetic. Apart from one or two early types, the dinosaurs seem to have been unaffected by these extinction events. As the Jurassic Period opened, Italy, Greece, Turkey, and Iran were attached to the North African portion of Gondwanaland. The climate was warm and moister than during the Triassic. Reptiles were the dominant form of animal life and experienced a great adaptive radiation. In the oceans various types of ichthyosaurs and plesiosaurs evolved. In the air the pterosaurs began to diversify. On land many Triassic dinosaurs (prosauropod herbivores and coelophysid carnivores) continued, while a number of new forms (giant sauropods and armoured scelidosaurs) evolved. Under the feet of the dinosaurs rodent-like tritylodontid Therapsids co-existed with primitive shrew-like mammals and lizard-like sphenodont reptiles. Crocodiles appeared also, but they were mostly aquatic forms. During the early Jurassic then, evolution seems to have polarised: on the one hand there were the ruling land animals, the great dinosaurs, which filled the ecological roles now taken up by medium-sized and large mammals; on the other hand the first mam-mals had appeared, and together with the tritylodont Therapsids they filled the small rodent and insectivore niche. The mam-mals were to remain small and individually insignificant - comparable to shrews, mice and rats of today - although doubtless very significant ecologically, for the 135 million years of the dinosaurs reign. "During the Early Jurassic on the southern continents, Gondwanan floras came to resemble more closely those of the northern continents. Typically equatorial groups like Bennettitales and Cheirolepidiaceae, along with dipteriaceous and matoniaceous ferns, became more important components of the Gondwanan flora. Major differences between Jurassic floras of Gondwana and Laurasia included the relative paucity of Ginkgoales and Czekanowskiales and the greater importance of podocarpaceous conifers in the southern regions, although podocarps are known from Laurasia as well." In the several million years following the Rhaetic extinction of the last armoured placodonts and great Shastosaurs, a new dynasty of marine reptiles, consisting of new types of ichthyosaurs, plesiosauroids and pliosauroids, and fish-eating crocodles, quickly evolved and diversified. 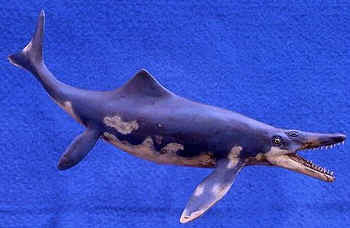 The Ichthyosaurs included a number of types of streamlined medium-sized 2 to 3 meter long) animals, similiar in size and appearance to modern Dolphins, although their body-design and ectothermic metabolism indicated they were sprinters rather than endurance swimmers, and larger predatory types (family Leptopterygiidae), attaining 5 to 9 meters in length, and ecologically comparable to modern toothed whales. The Plesiosaurs were another diverse group, including both small and giant forms. Foremost among them were the Rhomaleosauridae, large but primitive pliosaurs with powerful crocodile-like jaws and medium-length necks. Reaching upto 7 meters in length, these animals shared the role of top marine predator with the Leptopterygiid ichthyosaurs. But already the plesiosaurs were beginning to evolve into the familiar long-necked small-headed Plesiosauroidea and the larger headed, short necked, streamlined Pliosauroidea that were to inhabit the oceans for the rest of the Mesozoic era. The third party of Mesozoic marine reptiles, the Teleosaurid crocodiles, appeared in a rapid evolutionary radiation only at the end of the early Jurassic (Toarcian epoch). Theye were to continue as a success story until the end of the Jurassic, but were less common during the Cretaceous, dying out early into the period.
" Early Jurassic herbivorous tetrapod assemblages were dominated by prosauropods, cynodont synapsids, and a variety of mostly small ornithischian dinosaurs. The latter included, in addition to the Fabrosauridae, the Heterodontosauridae and the armored Scelidosauridae. The Heterodontosauridae were bipedal forms that foraged 1 meter above the ground. The skull was sturdily built and had a well-developed dentition with robust, closely spaced cheek with distinct wear facets along the length of the tooth row. These dinosaurs would have been capable of processing relatively plant material. The Selidosauridae were quadrupedal forms characterized by robust, leaf-shaped teeth with high-angle double wear facets. Their foraging range was probably within 1 meter above the ground. The Tritylodontidae were small to medium-sized, extremely mammal-like cynodont synapsids, which persisted well into the Middle Jurassic. They had multcuspid cheek teeth that met in complex occlusion and an extensive palinal power stroke, well suited for shredding fibrous plant material. These quadrupedal forms foraged within a meter above ground level. The structure of the shoulder girdle and forelimb suggests capability for digging, and wear on the enlarged incisors is consistent with digging for underground plant parts." Image: © Alison Jeffs, from Science Views, by permission. With the Rhaetian extinction of the basal Rauisuchia, the Dilophosaurine theropods emerged as the top predators of their day. The first of the great dinosaurian carnivores, the Dilophosaurs were active, graceful animals, easily able to tackle the contemporary prosauropods, vulcanodontid sauropods, and scelidosaurs that made up the main herbivorous fauna of the times. The double crest on the top of the head was probably a sexual display device. During the early Jurassic then, evolution seems to have polarised: on the one hand there were the ruling land animals, the great dinosaurs, which filled the ecological roles now taken up by medium-sized and large mammals; on the other hand the first mammals had appeared, and together with the Tritylodontid Therapsids they filled the small rodent and insectivore niche. The mammals were to remain small and individually insignificant - comparable to shrews, mice and rats of today - although doubtless very significant ecologically, for the 135 million years of the dinosaurs reign.